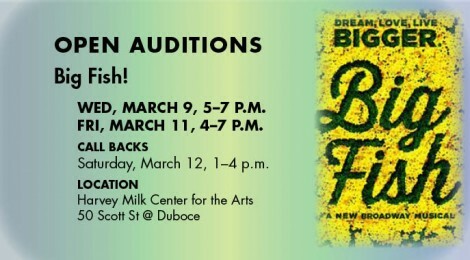 Wednesday, March 9, 5–7 p.m.
Friday, March 11, 4–7 p.m.
Saturday, March 12, 1–4 p.m.
BIG FISH is a new Broadway musical featuring music and lyrics by Tony nominee Andrew Lippa (The Addams Family, The Wild Party) and a new book by esteemed screenwriter John August (Big Fish, Charlie and the Chocolate Factory). Based on the celebrated novel by Daniel Wallace and the acclaimed film directed by Tim Burton, BIG FISH centers on Edward Bloom, a traveling salesman who lives life to its fullest… and then some! Edward’s incredible, larger-than-life stories thrill everyone around him – most of all, his devoted wife Sandra. But their son Will, about to have a child of his own, is determined to find the truth behind his father’s epic tales. Prepare a song to sing and bring the sheet music for the accompanist (provided). Bring headshot and resume if available.